When the Lib-Dems enabled the Tories back into power in 2010 Caroline Spelman was one of the 23 millionaires David Cameron appointed to his cabinet. He ignored the obvious conflict of interest of her ownership of a lobbying company for the food and biotech industries and put her in charge of the Department of Environment, Food and Rural Affairs. David Cameron and George Osborne made it clear to all of their cabinet members that they were expected to ruthlessly slash their departmental budgets in line with the economically illiterate "let's cut our way to growth" austerity dogma they were pushing. Spelman was keen as mustard. Not only did she set about gleefully slashing DEFRA spending, in order to score brownie points with Cameron and Osborne she ensured that her department suffered the deepest cuts of any department outside of the treasury. In order to make herself look like the most loyal of all of Cameron and Osborne's slashers she decided to ignore the expert advice and inflict massive cuts to flood defence spending. The expert advice said that cutting flood defence spending to make short-term savings is an incredibly self-defeating example of creating false economies. This is because for every £1 spent on building or maintaining flood defences, £8 is saved in avoided economic damage. Thus for every £1 in spending cuts Spelman inflicted on flood defence spending in order to impress Cameron and Osborne, the cost to the country would be £8 further down the line. Unfortunately for Spelman "further down the line" happened to occur very quickly indeed with appalling flooding in Cumbria in the summer of 2012. particularly badly hit was the town of Kendal which, thanks to Spalman's flood defence cuts, had had their flood defence improvement scheme cancelled. 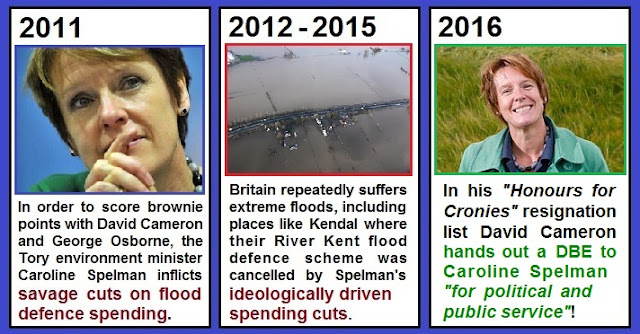 It's unlikely that the people in Kendal who had had their homes and businesses ruined by flooding thought that their misery was a worthwhile sacrifice to help Spelman win brownie points with Cameron and Osborne, but Spelman obviously did. Despite the appearance that Spelman had been sacked for following Cameron and Osborne's instructions too enthusiastically, she never spoke out or criticised them for throwing her under the bus to deflect attention away from their own culpability in the flood defence debacle. Even after more massive floods hit in Somerset in 2013-14 and the massive floods that hit Cumbria and southern Scotland in 2015-16 she kept her lipm firmly buttoned. After his reckless Brexit gamble failed in 2016 David Cameron handed Spelman the reward that she had been waiting for: In return for loyally keeping her gob shut about the austerity-flood defence cuts debacle Spelman was handed a DBE in Cameron's resignation honours list. Of course Spelman's gong was far from the most controversial of Cameron's handouts. Cameron showered peerages, knighthoods and assorted other gongs on his cronies like confetti. Millionaire Tory donors, loads of other Tory MPs, millionaire bankrollers and inept strategists for the failed Remain campaign, loads of Tory advisers, George Osborne, George Osborne's image consultant, even Samantha Cameron's personal stylist ... but Caroline Spelman's DBE really is indicative of the hopelessly out-of-touch bubble of wealth and privilege that Cameron exists in that he could actually have thought that it would be a good idea. 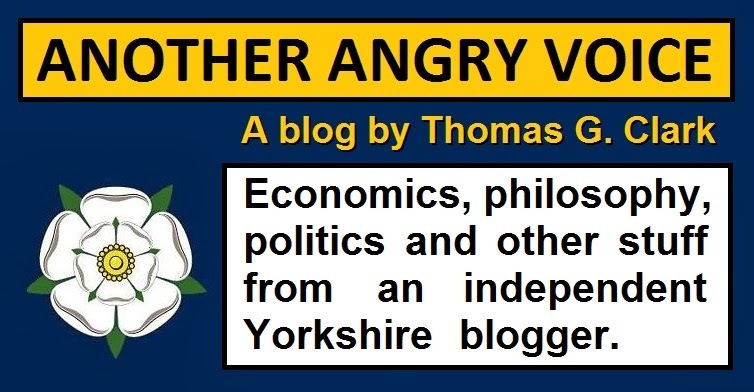 Just think about all of the misery suffered by the thousands of people who have had their homes, businesses and property ruined by flooding in the last five years that could have been prevented or mitigated had Spelman not inflicted such savage ideologically driven cuts on flood defence spending. Just think about how these people must feel seeing Cameron handing out a gong to Spelman for "political and public service", and another gong for "political and public service" to George Osborne, who was the architect of the economically illiterate austerity agenda that drove Spelman to make such idiotically counter-productive cuts in the first place.